Our Lord's Nativity is observed on December 25. The early church fathers made the birthdate of our Lord deliberately to coincide with and offset the pagan celebration of Saturnalia, that festive pagan day of celebration in which the sun crossed the imaginary line drawn on the later-day maps as the equator. To the pagans it signified a rebirth of the sun, now returning to the north to assert its full power and bring on the spring season; but to the Christians it marked the birthday celebration of Jesus Christ, the Son of God who had created not only the sun, but all the other stars and planets of the universe. Jesus Christ who on more than one occasion said simply, "Follow me," leaving no chart but that which lies in the true Christian heart and which requires no formula beyond that which we call "love." The Old Testament abounds in testimony of the coming Messiah, long anticipated by the prophets, who were aware that the original sin of man who was stained by evil in the Garden of Eden could only be cleansed by the blood of a Messiah sent by God. The theological recognition of god as representing universal love also recognised that God chose to share love with man, and for that purpose was man and woman created. A second premise is that man has it within his grasp to find happiness; and a third, that in doing so he glorifies God in whose image he was created. That placed man in harmony with God and nature; but this harmony was shattered by Adam and Eve who, in the disobedience of God in paradise, lost their membership in the alliance and were at the mercy of nature, as well as the mercy of God. Man had fallen from grace and had no mastery over nature; but God, in his infinite mercy, was not about to obliterate that which was cast in His own image. Therefore, He saw to it that with the ascendancy of a sun in winter He gave to the world His only begotten Son. 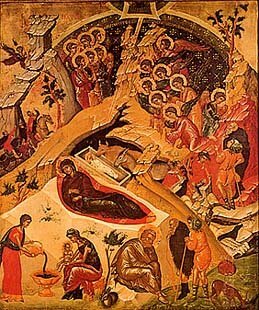 The Christian soul has been spared because on December 25 the Saviour was born, and God so loved the world He had created that He sacrificed his Son thirty-three short years later for the redemption of all mankind. The star that shone over Bethlehem on the eve of the Saviour's birth to light the way for the Wise Men of the East still shines as an eternal beacon in the hearts of all those who have Jesus Christ in their hearts.